And here is another stellar bird in flight: Cygnus this time. The brightest stars of Cygnus form a cross, so the swan is also known as the Northern Cross. Find it soaring high overhead during late summer evenings. The constellation’s brightest star is Deneb. Although it lies about 1,500 light-years from Earth, Deneb shines brightly in our night sky because it’s a white supergiant — a star that’s much larger, hotter, and brighter than the Sun. Deneb is the northeastern point of a star pattern called the Summer Triangle. 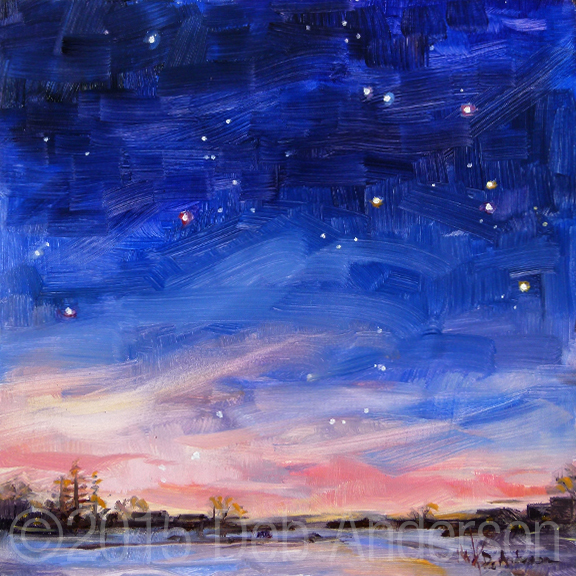 This entry was posted in landscape, night sky, Stars and tagged blue, cygnus, Deb Anderson, night, oil painting, sky, stars. Corvus the Crow, soaring over a frozen lake. Another small, ancient constellation, yet very easy to recognize. Corvus was a bird of the god Apollo, who in different stories upset the god so much that he transformed the crows feathers from silver to black and placed his image in the sky. Corvus can be found sitting on the tail of Hydra, the sea serpent. Another way to find Corvus is to look just below the constellation of Virgo, the maiden. This entry was posted in landscape, night sky, Stars and tagged constellation, Corvus, Deb Anderson, night sky, oil painting, stars. Orion is a prominent constellation located on the celestial equator and visible throughout the world. It is one of the most conspicuous and recognizable constellations in the night sky. It was named after Orion, a hunter in Greek mythology. Its brightest stars are Rigel (Beta Orionis) and Betelgeuse (Alpha Orionis), a blue-white and a red supergiant respectively. Many of the other brighter stars in the constellation are hot, blue supergiant stars. The three stars in the middle of the constellation form an unique asterism known as Orion’s belt. The Orion Nebula is located south of Orion’s belt. This entry was posted in landscape, oil, Stars, Uncategorized and tagged constellations, Deb Anderson, night, oil painting, orion, stars. At dusk on July 11 the thin crescent of the waxing moon set alongside Regulus: the Heart of the Lion. I’ve had it in my head that if you hold a quarter at arms length, that’s about how large both the sun and moon appear from Earth. Not true. I tested it out and was surprised at how tiny the moon looks. With a ruler held at arms length, it measured less than a quarter inch. I’ve noticed that when I take photos the moon looks smaller. I thought it was the camera distorting the scene, but it’s my brain doing the distorting. My mistake is probably unrelated to the “moon illusion” where the moon seems larger towards the horizon. (It’s really the same size, of course, but it appears slightly smaller, since it’s farther away from the viewer by one Earth radius). If you’re outside today, stay cool and wave to the Cassini spacecraft – it’s taking a photo of Earth through the rings of Saturn, over a billion miles away. This entry was posted in landscape, Stars and tagged Deb Anderson, landscape, night, oil painting, Regulus, stars. I was recently bowled over by this video. 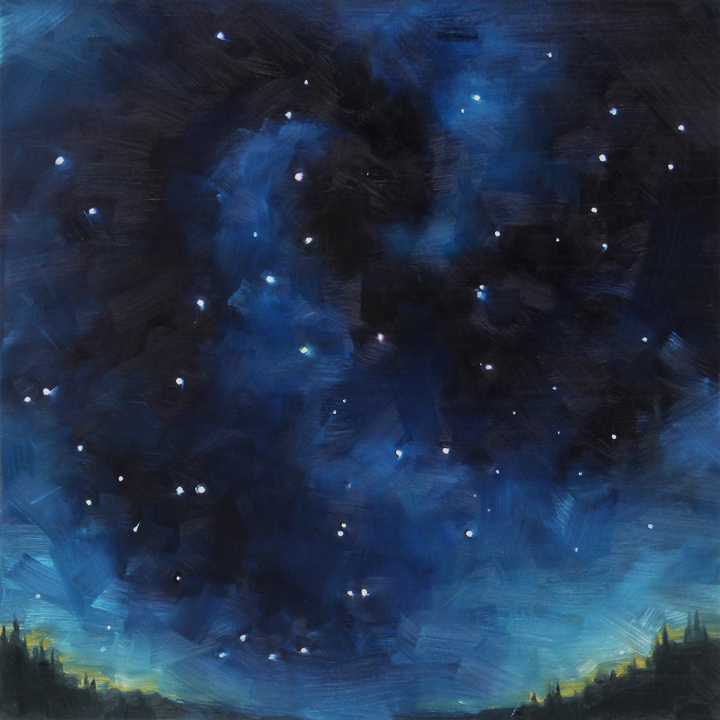 In tribute, here is a painting of the constellation Ursa Major, with it’s prominent asterism the Big Dipper, and the tiny area north of it where the first of the deep space field images was captured. Speaking of bowled over, the bowl of the Little Dipper is over in the upper right corner. This entry was posted in landscape, oil, Stars and tagged Astronomy, Big Dipper, Deb Anderson, Hubble Space Telescope, Images, landscape, Little Dipper, NASA, night, oil painting, stars, Ursa Major, Ursa Minor.